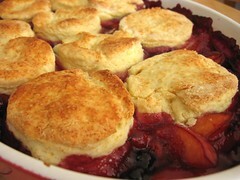 Nectarine Blueberry Cobbler - Do You Know The Muffin Man? Notes: A very easy recipe to make, start to finish in under an hour. The biscuits contain no butter, with the only fat coming from the cream. The dough was a bit dry, so I kneaded it a few times to distribute the moisture. Surprisingly, the biscuits were quite flaky and tender, but very bland as there isn't much sugar. They're a good match for the juicy fruit.